Have you heard the news? Organic is the new conventional! No longer considered a bit wacky, organic gardening has become almost mainstream. Informed consumers who desire high-quality food have become informed gardeners who want to grow their own organic, nutritious and delicious food. And that's good news! This post may contain affiliate links; you can read my affiliate disclosure here. Mark Highland has written the definitive guide to organic practices in the garden, Practical Organic Gardening, the No-Nonsense Guide to Growing Naturally. Mark produces organic soils sold under the brand name The Organic Mechanic Soil Company, and as you might expect, his book is written on the principle that good soil is the foundation of a vibrant garden and nutritious food. Maintaining soil health is key to your garden's success, and Mark writes about the damage that is done to gardens and to our world by using commercial fertilizers and pesticides. He goes into the science behind those commercial products and the results of using them, and compares this to natural, organic practices. The book covers a lot of ground (pun intended!) 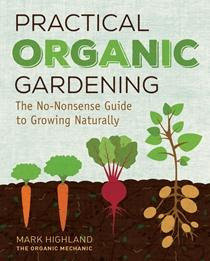 with chapters on soil structure, organic plant propagation, no-till gardening, garden planning, and so much more. Organic gardening is safer for your family and for the environment, and Practical Organic Gardening gives you the information you need so you can grow vigorous, healthy plants. Not all products on store shelves are bad; Mark guides you through the bottles and bags at your gardening center and tells you which amendments are natural and which aren't. You can even make several fertilizers at home (including my favorite, comfrey tea); directions are included in the book. My favorite quote from the book is "Compost is the duct tape of the garden. It fixes nearly any problem." I find the process of composting fascinating and I truly enjoyed that section. Another key to a garden's success is water, which is no surprise since water is key to life itself. An entire chapter gives advice on when and how to water, the best water sources for your plants, and instructions on installing watering systems and rain barrels. Got pests? This chapter includes photos of common insects for identification purposes of both beneficial and harmful pests, and delves into the best ways to deal with a pest problem. Practical Organic Gardening isn't limited to the vegetable garden; gardeners are turning to organic practices in their flower gardens and yards as well. From vegetables and flowers to shrubs and lawns, you'll learn the most-effective ways to grow beautiful plants without chemicals. This is a modern, scientifically-based guide into organic methods that will help home gardeners transition from conventional to organic practices. While some of the scientific information was a bit over my head, I always appreciate an author who can take that data and put it into a form that's more easily digestible and simple to understand, which Mark has done well. Disclosure: I was given a copy of Practical Organic Gardening for my review; however all opinions expressed in this post are 100% my own. I will only review items that I'm sure you will love! The image below is an affiliate link. You can read my affiliate disclosure here.